David had gotten let go from his last employer and needed a resume to help him stand out from his competition and reflect his many career achievements. One common thread David had throughout his career was he built up brands that were already successful as well as implemented analytics and technology to help improve processes and results. This is why I chose to highlight the strategies he used over and over again, with specific examples in the summary section. The challenge was narrowing down the highlights to just select the best. Since marketing is all about impact and results, I titled his professional experience section as such. 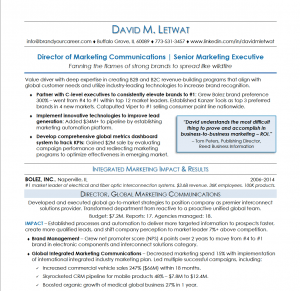 In addition, he had significant experience that was very relevant to his targets even though it was a number of years ago so I added the “Additional Brand Building Capabilities” section to emphasize this trend in his career. I chose just to use the number of years at each position to show longevity and de-emphasize his age. To help his achievements stand out, I classified them all with keywords and used the achievement as a proof point. I also used all figures for numbers so they could be scanned quickly. 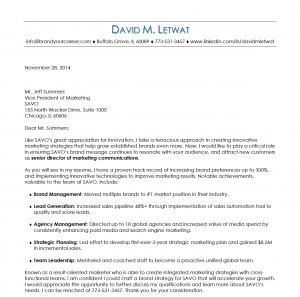 I added in excerpts from his LinkedIn recommendations to break up the content, visually, and add credibility.